I am a self-published author, an indie author, DIY writer; call it what you will. And as such, I know the power of reviews. So when I received this email from a major reviewer — The Midwest Book Review — through my PR rep, I was delighted. Good afternoon! Abby forwarded your request to me so I could handle it personally. The book is published only as an ebook, due to the unique storytelling where you click embedded hyperlinks to make your choice and progress through the narrative. I can send you the book as an Amazon gift or in whatever format is convenient for you. 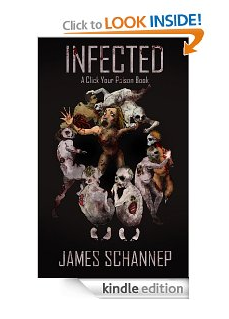 Thank you for your interest in INFECTED: Click Your Poison #1. I look forward to hearing from you. Thank you for your information and offer. There is a charge of a $50 “Reader Fee” for reviewing ebooks, pre-publication manuscripts, galleys, uncorrected proofs, ARCs, and pdf files. If you wish to purse (SIC) this then let me know and I’ll send you the name and email address of the assigned reviewer. The check would be made out to the reviewer who would also tell you what information would be needed along with a copy of the title to be reviewed. The reviewer would provide you with a copy of the review and you would have automatic permission to utilize the review in any manner you deem useful to promote and market the book. I will also be provided a copy of the review and it will run in our book review publication “MBR Bookwatch”, be posted on the Midwest Book Review web site for five years, and published in “Book Review Index” which is distributed to thousands of academic and community libraries throughout the United States and Canada. Published books in a traditional print edition (paperback or hardcover) are reviewed free of charge. Please let me know if you’d like to proceed further. I’m sorry, but I don’t believe in paying for reviews. Furthermore, I challenge you to reconsider your stance on ebooks. Lumping them in with other “incomplete” publications is insulting to authors, and ultimately short sighted. Ebooks are the future. Many authors (myself included) put considerable time, effort, and money into making their ebook a professional product. I believe your organization legitimately wants to help authors, but this policy flies in the face of that goal. As of this post, I haven’t seen a response. This is not meant to be an attack on Mr. Cox or his group of reviewers, though it is an attack on his policy. What do you think? Should I have paid the $50, happy to get whatever press I can, or am I right to be outraged? What would you have done? I agree with you and Christian. Keep up the good work. (Would be curious if other such organizations have similar policies) Take care and God bless, Pastor Greg Faith Fellowship http://www.f2clc.org Life is short & God is good, No matter what! I guess my question is why charge for some and not others? Is it a matter of time and energy spent reviewing? I would think each review deserves the same amount of attention with the exception that longer pieces would take longer to read and review. Based on the title of the organization I would think they charged because that is how they “make a living.” In that case, they should charge for all reviews. I don’t see the logic, however, in grouping completed ebooks with incomplete works. Good luck! Thanks for commenting, everybody. First update: after doing some digging, I found a thread with authors complaining that their reviews from The Midwest Book Review were taken off Amazon. Apparently the web-giant also thinks it’s wrong to charge for reviews. So there you have it. I’d not only be out $50 for the review, but it would be all for nothing since the review would’ve violated Amazon’s policy anyway.